Today’s post is a little bit of a challenge. 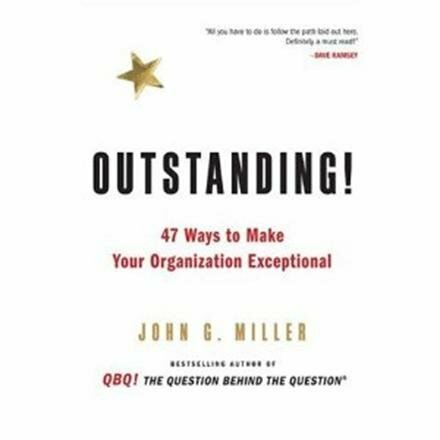 I will briefly discuss a book entitled Outstanding: 47 Ways to Make Your Organization Exceptional by John G. Miller and yet this blog has been unremarkably silent over the last month and half or so. (Not outstanding in the least). But here’s to getting back in the swing of things. This book is an excellent piece on making your company (whether it is composed of 1 employee or 1,000) better. It speaks to customer service and about how to treat employees and more. While the title specifically talks about an organization, realize that whether you work at the collegiate level with a big staff or if you cover high school football games by yourself on Friday night, you can benefit from reading this book. Sometimes, I think that those in the field of Athletic Training and Fitness don’t place much emphasis on improving and polishing our “business skills”. Unfortunately, that is a huge mistake. Understanding the human body and the best evaluation strategies and evidence based treatment practices are extremely important, but understanding the principles that will impact your ability to deliver those services are equally important. So if you have neglected improving your business and customer service skills, make sure you read this book. It is a quick and easy read and full of practical tips that will allow you to become OUTSTANDING!